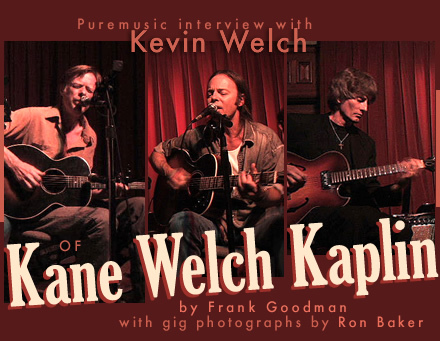 Kane Welch Kaplin is a folk group made up of two great singer songwriters (Kieran Kane and Kevin Welch), multi-instrumentalist Fats Kaplin, and Kieran's percussionist son, Lucas. When you think about it, it's strange there aren't more folk groups around, when Bluegrass or Old Timey music by necessity spawn seemingly endless ensembles. But in singer songwriter world, it's possible and it's commonsensical to tour solo, or duo. And as a duo is how it started: after Kieran's group (with Jamie O'Hara) The O'Kanes broke up, Kevin first began seeing Kieran's talents as a session man. But all that and the further evolution of the lineup and modus operandi of this compelling quartet is detailed in the relaxed and deadpan Oklahoma delivery of Kevin Welch in the conversation to come. It's a very artistic group, without being consciously so. That is, each of the three seasoned guys have done so many things and been artists already for so long, that a great deal of experienced spontaneity erupts during a KWK show that's not much like the aforementioned acoustic groups at all. It's more about the song, the atmosphere, and the chemistry, and the room. It's more vibe-y. And as Kevin points out, they don't talk about it, not at all. I don't know much about Lucas, except that what he adds as the youngest member of the group musically is very tasteful, and crucial. The other three are well known to me as a longtime Nashvillian, and are, to a man, deep as a well. Kieran was very successful with the O'Kanes, and is a visceral force of nature, evidenced of late also in his impressive paintings, several of which are featured on the covers of KWK releases, including the most recent. I always considered Kevin Welch among Nashville's finest writers, with a very strong writing "voice," on top of being a superlative performer. And Fats' recording credits and touring schedule tells all that need be told about his distinguished career; you must check out his latest CD, The Fatman Cometh, reviewed in these pages. You'll want to pick up the new Kane Welch Kaplin CD after you check out the clips on the Listen page. We caught up with Kevin Welch recently in Canada, and he talked with us as they were packing the cars for the next show.